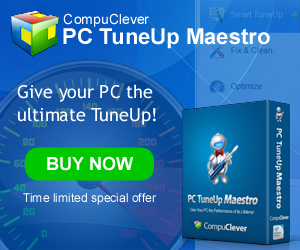 With PCTuneUpMaestro you can identify what's causing your PC to slow down. You can then fix all speed issues to finally have a Clean, Optimized, and Faster PC. The more you use your PC, the slower it gets. Over time, unused processes, Windows® registry errors and junk files accumulate; making it harder for your PC to retain stability and speed. With the following simple steps, you can not only revitalize your PC but also make sure it stays optimized. Run a free scan to check what is slowing your PC and how much hard disk space can you gain. 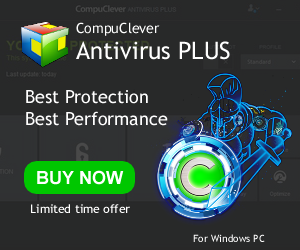 CompuClever Antivirus Plus 2017 - Unparalleled Security Technology Against Malware Threats. It's designed to deliver the best performance for your PC and it’s built on the most advanced antivirus technology available today. Exceptional in its ease of use, it allows you to handle security with a single click. The intuitive technology also guards your online privacy and digital identity. Download the best antivirus for Windows from Bitdefender and get protection against viruses & anti spyware without slowing down your PC. Your PC often stores unwanted “junk” files and traces of your personal information including passwords, credit card information, and email / chat communications. This occurs without your knowledge or consent. As a result your PC runs slower and exposes you and your family to identity and security theft. PC Clean Maestro removes unwanted files and it eliminates confidential information so your PC is clean and safe. ​Your PC often stores unwanted “junk” files and traces of your personal information including passwords, credit card information, and email / chat communications. This occurs without your knowledge or consent. As a result your PC runs slower and exposes you and your family to identity and security theft. PC Clean Maestro removes unwanted files and it eliminates confidential information so your PC is clean and safe.